48 anglers (24 pairs) fished the Match & Specimen Lakes. Conditions were cold & windy. 1st Dan Myers (Frenzee) 138-06-00 peg 26 Match Lake, via pole & pellet and down edge. 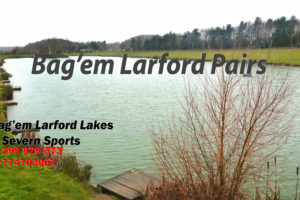 2nd Harry Harris (Bag’em Larford) 129-06-00 peg 28 Match Lake, via Method and down edge. 3rd Chris Cameron (Middy) 78-07-00 peg 16 Match Lake, via Bomb & Pellet. 4th Alison Jones (Colmic) 59-14-00 peg 42 Match Lake, via pole & pellet.